This event is hosted by Hot Glass Academy, 701 McGarrah St. in Americus. Cost is $65. For more information on the workshops, call 585-704-6942 or email info@hotglassacademy.com. The topic is “Tap Into Spring” at this First Friday event in downtown. For information, call 229-924-4411, Ext. 247. Join thousands of visitors in Americus for this annual event, which combines glass blowing with one of Georgia’s fastest-growing industries. The festival is quickly becoming one of southwest Georgia’s favorites. For more information or tickets, call Americus Main Street at 229-924-4411, Ext. 247. Enjoy this annual spring event in downtown Plains. For more information, call 229-938-3835 or 229-928-4825. Help kick off spring with this fun event, now in its third year. For more information, call Hannah at 229-924-0091. President Carter teaches Sunday school at Maranatha Baptist Church in Plains. Visitors must arrive early. For more information, call 229-824-2896. Boarding begins at 9:30 AM at Georgia Veterans State Park Depot at Lake Blackshear. The train departs at 10 AM and arrives in Americus at 11:25 AM at the Jackson Street Depot for a 1 hour, 50-minute layover. 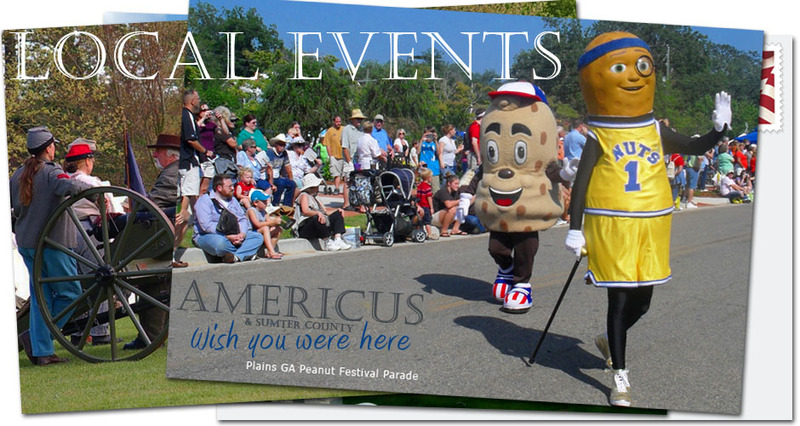 The train departs Americus at 1:15 PM for Plains. For information on this and all other SAM Shortline rides, call 1-877-GA-RAILS or 229-276-0755, or visit Samshortline.com. This Sumter Historic Trust tour of Andersonville will be led by Georgia Southwestern State University history professor Dr. Evan Kutzler. For more information, call Kim Christmas at 678-671-2019 or 813-967-6448 or 866-395-0088, Ext. 4304. The topic is “May’d in Sumter” at this First Friday event in Americus that celebrates Sumter County products. Jeremy Davis and Clay Johnson, with their high energy show that is the Fabulous Equinox Orchestra, bring their rich friendship and charm to the stage at the Rylander Theatre in Americus. In the style and swagger of legendary entertainers like Frank Sinatra, Davis and Johnson are putting their own stamp on the Great American songbook, graced with a touch of Johnny Cash, Elvis, Ray Charles, Motown and more. The Fabulous Equinox Orchestra features 11 highly trained musicians, including Davis and Johnson on vocals. Presented by the Friends of the Rylander Theatre, this Thursday night performance concludes the 2018-2019 Presenter Series season. Tickets are reserved seating, $35 adults and can be purchased online at Rylander.org or through the Rylander box office, Tuesday-Friday from 11 a.m. to 4 p.m., at 229-931-0001. Come to Lenny’s Market at 110 N. Hampton St. for the 2019 “soft” opening. Fresh, seasonal and organically grown products and a variety of items are among the offerings. The market will be open until 1 p.m. For information, call 229-924-4411, Ext. 247. Visit Lenny’s Market at 110 N. Hampton St. for its 2019 ribbon cutting. For more information, call 229-924-4411, Ext. 247. 678-671-2019, 813-967-6448 or 866-395-0088, Ext. 4304. The theme is “Luau!” for this month’s First Friday event. For information, call 229-924-4411, Ext. 247. Come and enjoy this early pre-Fourth of July event for the second straight year. Participants will gather at the Jackson Street Depot to celebrate. For information, call 229-924-4411, Ext. 247. The theme is “Beach Party” for this month’s fun downtown event. For information, call 229-924-4411, Ext. 247.